As construction continues along the North Shore of Staten Island, the New York City Economic Development Corporation (NYCEDC) released a report this week detailing “never-before-seen” levels of investment in the area, totaling $1.6 billion. The figure includes $1 billion of private capital alone and an additional infusion of $600 million in public funds. The North Shore redevelopment project, particularly along the St. George waterfront, is anchored with several notable projects like BFC Partners’ Empire Outlets designed by SHoP Architects and the New York Wheel, a Ferris wheel that will stand 625 feet over the harbor. 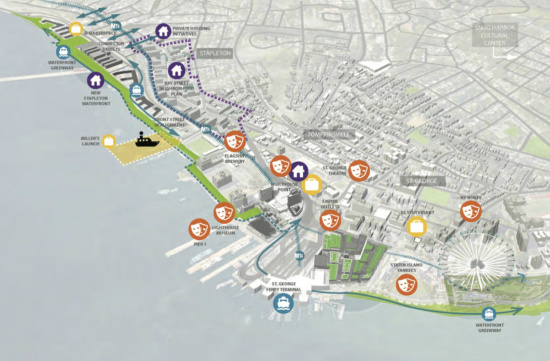 The report also touts updated numbers on the economic impact of the proposed North Shore transportation and tourism hubs, with the NYCEDC estimating that those projects will attract 2 million tourists annually, increase housing by 4,000 units, and add over 2,000 jobs to the local economy. Lighthouse Point, a mixed-use development with a museum, is a large contributor to these statistics as well as the borough’s investment in a startup incubator and marker space further south in the Stapleton neighborhood. Most elements of the North Shore plan will open in early 2018.